Council chiefs in Edinburgh are said to be considering a proposal to add an extra £2 to journeys between midnight and 5am in the city on Friday and Saturday nights. The idea is to encourage more cabbies to work late but the industry has hit back by saying it could stop people from using a taxi to get home safely after a night out. According to representatives of the taxi trade, there is no need for such a ‘party tariff’. Members of the Edinburgh Taxi Association, Comcab, City Cabs and Central Taxis met at the City Chambers and unanimously rejected any proposals to add an extra charge to journeys after midnight on weekends. According to the director of City Cabs, Les McVay, the city isn’t as busy as it once was and there are a huge number of taxis operating. He believes an extra charge would make passengers more reluctant to hire a black cab to get them home safely. The taxi trade also wants traditional holiday and Christmas increases to be simplified or reduced. McVay said the trade doesn’t want to discourage people from hiring a cab during the busy festive period. The director of Central Taxis, Tony Kenmuir, agrees and said most drivers expect to receive double pay over the Christmas and Hogmanay periods but meter readings increase by less than 50%. Yet he believes the lower fares encourage people to go out, enjoy themselves and then use cabs to get home. He concluded by saying his company are happy to unite with other black cab firms and recommend a reduction in holiday fares. There are some cabbies who are delighted with the news as they believe the added tariff provides a greater incentive to work later. Statistics show that working after midnight can be perilous for cab drivers as they are forced to pick up drunken revellers. Unfortunately, things can get out of hand and damage gets caused to the cab. 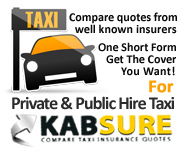 The result is an insurance claim and the cabbie’s next insurance quote will be much higher. Kezia Dugdale, Lothian Labour MSP, believes the increased tariff means women will have to pay a higher price to get home safely after a night out which is unfair. The scheme is already in place in other UK cities such as Glasgow so consultants are trying to find out the impact of the scheme in these locations. Councillors are expected to receive a report on the proposals in around four month’s time. According to a spokesman for the council, taxi fare structures are regularly reviewed. He confirmed that there were discussions with members of the taxi trade about a late night tariff along with other proposals. He concluded by saying the council’s regulatory committee will hear a report on the trade’s recommendations in November.